Written by Alan Moore; illustrated by Dave Gibbons. 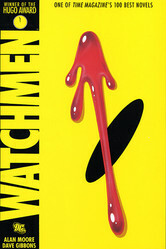 Don't miss this new edition of WATCHMEN! The story begins as a murder-mystery and quickly unfolds into a planet-altering conspiracy as these unlikely heroes - Rorschach, Nite Owl, Silk Spectre, Dr. Manhattan and Ozymandias - must test the limits of their convictions and ask themselves where the true line is between good and evil. The original, epic story is collected here with a new cover, sketches, bonus material and an introduction by artist Dave Gibbons.